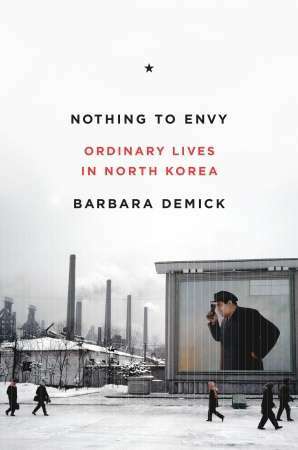 The other book I read regarding life in a hard place recently was Nothing to Envy: Ordinary Lives in North Korea by Barbara Demick. Now, if we don't know much about what life is really like in Pakistan and Afghanistan, then I think it is safe to say that we know even less about life for the ordinary person in North Korea. This book has been sitting on my bedside table for about six months. It came warmly recommended. But I just couldn't pick it up. Maybe it was the grey cover that stopped me from opening it. It looks pretty bleak. And yet, when I finally got started I couldn't put it down. On opening to the first page, what piqued my interest immediately was a photo similar to this one right at the beginning of chapter one. Click on the picture to get a better view. It is an aerial view by night of North and South Korea and surrounding countries. 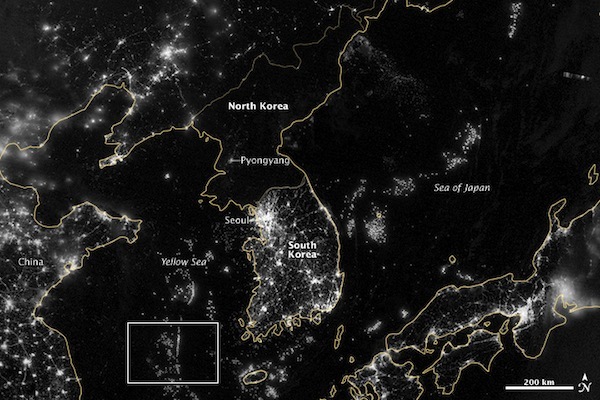 Notice all the light patches - cities and towns lit up with night life illuminated by the electric light bulb. Then, in the middle of it all, an expanse of blackness nearly as large as England. It is baffling how a nation of 23 million people can appear as vacant as the oceans. North Korea is simply blank. North Korea is not an underdeveloped country; it is a country that has fallen out of the developed world. What happened that a developed country fell into darkness, famine (20% of its population died of starvation during the 1990's) and utter disarray in the space of a few decades? Nothing to Envy is an oral history. It follows the life of six North Koreans. Some of the six remember life before the current regime took power and know just to keep their mouths shut. The rest have grown up under the regime with heads so full of propaganda (North Korea is not connected to the Internet and no-one, at least legally, owns a mobile phone) that they believe that they truly have nothing to envy about the outside world, that the North Korean government is looking after them and that all is in hand. The book covers fifteen years taking in the death of Kim Il-sung and the rule of his son Kim Jong-il. Eventually, for these six people, doubt creeps in. Doubt in time leads to courageous defection and that is how Barbara Demick, an award winning journalist from the Los Angeles Times, comes to meet with them, interview them over many months and corroborate their stories with others in order to weave together a picture of life in this closed country. It is grim reading. Not the least because what has happened in North Korea has happened, and is happening, in our lifetime. But be not put off by that comment or by the bleak cover. Once I opened this book I could not put it down. Because for all its bleakness, I was also inspired. This is courage and tenacity at its absolute best. Written down beautifully, insightfully and cleanly. The word that springs to mind is "compelling." Also, it is good to know about this. And good to pray. Yay! Local library has this one so I've just put it on reserve. I'm thankful I'm second on the reserve list because otherwise I'd be tempted to read when I should be writing reports. Timing should work out nicely. Excellent. I love it when I have a library win like that. It is such good reading and so worthwhile. I hope you enjoy it. And it is certainly one to share around to raise awareness.